Veteran journalists who cover the State Department say they've never seen anything like it. The new secretary of state, Rex Tillerson, has been all but silent in his first month on the job. And he is planning on traveling to Asia next week without the traditional coterie of traveling press with him. Journalists are strenuously objecting to the plan. But there is no indication that Tillerson is going to reverse course. The State Department may allow one hand-picked journalist to tag along, but the details are unknown. On Friday, White House press secretary Sean Spicer claimed that Tillerson was looking to save money by taking a smaller plane without room for reporters. However, news outlets normally pay for their reporters' seats, compensating the government for the expenses. Past secretaries normally flew with the so-called press "pool" as a matter of course, but the Trump administration seemingly wants that to stop. Tillerson was similarly press-averse while running ExxonMobil, according to Steve Coll, who authored "Private Empire: ExxonMobil and American Power." Tillerson never granted him an interview for the book. Now, as secretary of state, Tillerson has not given any interviews. He has appeared in photo ops with visiting dignitaries, but he has ignored the questions that reporters have tried to ask. "Still no answers from secretary of state Rex Tillerson," NBC chief foreign affairs correspondent Andrea Mitchell said after one of her attempts. "It's not that previous secretaries didn't sometimes duck questions. But Mr. Tillerson has been shockingly inaccessible since he was sworn in last month. On top of questionless photo ops, there have been no news conferences and no Sunday talk show appearances," former Reuters diplomatic corespondent Carol Giacomo, now a member of the New York Times editorial board, wrote on Friday. Coll called Tillerson's silent approach to the job "strange." 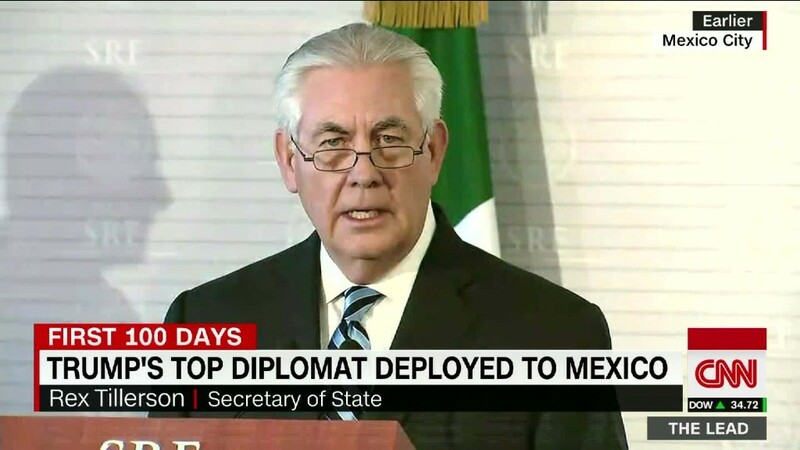 "It's such a departure of the life of the State Department," he said. "The secretary of state is the most important voice, after the president, representing the United States." Secretaries normally see interviews and press conferences as ways to articulate foreign policy to external audiences and address internal audiences at the same time. "Kerry, Clinton, Rice, Powell, Albright -- all very formidable public figures -- gained influence inside the administration by taking advantage of their own bully pulpit," Coll said. But Tillerson's approach has been different in many ways. Keeping his distance from the press is just one example. A dozen Washington bureau chiefs and editors, including representatives from CNN, sent a letter to the State Department earlier this week urging the secretary to make arrangements for "pool" travel. "Not only does this situation leave the public narrative of the meetings up to the Chinese foreign ministry as well as Korea's and Japan's, but it gives the American people no window whatsoever into the views and actions of the nation's leaders," the editors wrote. "And the offer to help those reporters who want to travel unilaterally is wholly unrealistic, given the commercial flight schedules, visa issues and no guarantee of access once they are there." CNN anchor Jake Tapper commented on the matter on Twitter: "Not bringing press on a trip like that is unusual & insulting to any American who is looking for anything but a state-run version of events." MSNBC anchor Greta Van Susteren also weighed in: "Tillerson should take media on trip to Asia -- Americans want to know and we pay his salary and his staff and plane." Voice of America correspondent Steve Herman replied to her tweet and added: "And it's not a free ride for media. We reimburse government for the travel costs." Up until this week, the State Department had not held an on-camera briefing since inauguration day -- a highly unusual break from tradition. The briefings are normally another way for the State Department to inform the public about foreign policy. This week, there were two on-camera briefings and two off-camera conference calls. Tillerson has yet to name a press secretary.